M. Schames & Son was founded by Mendel Schames (1876-?). Mendel Schames immigrated from Russia aboard the S. S. Kursk, sailing from Libau (Latvia), 23 Dec. 1913, and arriving in New York, 4 Jan. 1914. Schames's naturalization petition from 1928 states that he was born 15 August 1876 in Mohilav, Russia. Mohilav, Russia, would be the present day (July 2014) Mogilev, in Belarus. Mendel Schames appears in several census reports. The 1920 U. S. Census has him living at 22 Rutgers Place, Manhattan, age 40, born Russia, immigrated 1914. His occupation in 1920 was recorded as "Cementer, House." The census taker may have misunderstood. Mendel Schames at this time was usually identified as a painter. The 1925 New York State Census recorded him as a painter living at 723 Wythe Ave., Brooklyn. And the 1940 U. S. Census had him as "Owner, Paint Supply," at the same 723 Wythe Ave., Brooklyn. The son in M. Schames & Son was Leo Schames (1902-? ), born 15 Sept. 1902, in Mogilev, Belarus. Leo is possibly the child of 10 who accompanied Mendel Schames and was recorded on the ship's manifest of the S. S. Kursk in 1914. The name is hand written and seems to say "Lvoso." Like Mendel Schames, Leo Schames appears in several census reports. He was 18, the son of Mendel on Rutgers Place in 1920. He was 23 in the 1925 New York State Census, where his occupation was "Waiter." In the 1940 U. S. Census he lived on Rodney St. in Brooklyn with his wife, Ida, and three daughters, Arleen, Leona and Elinore. According to www.boweryboogie.com Schames acquired 3 Essex St. in 1927. The Polk city directories of 1933-34 list M. Schames & Son at 2 Hester St. in Manhattan and 483 Livonia Ave. in Brooklyn. The Manhattan telephone directory lists M. Schames & son at 2 Hester St. from 1929 to 1938. The address changed to 3 Essex St. in 1939. 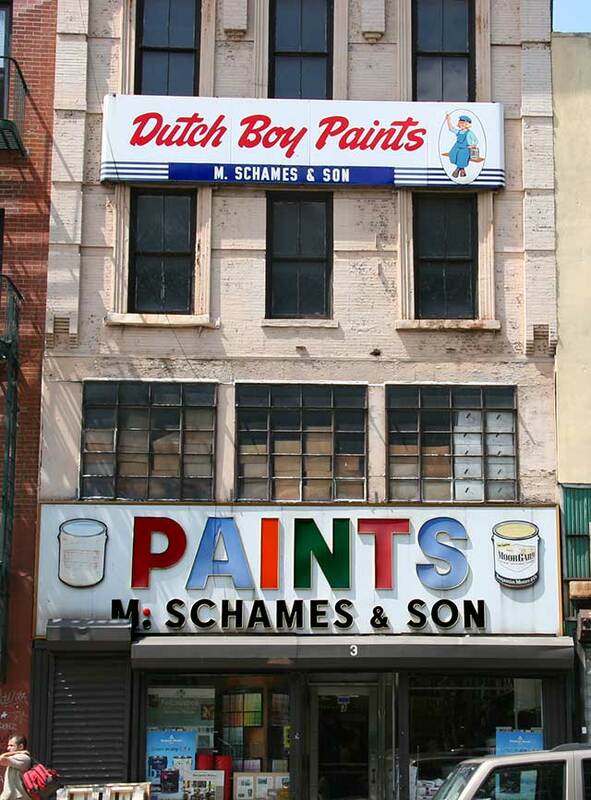 M. Schames & Son was relocated from 3 Essex St. to 90 Delancey St. in 2010. The current (July 2014) Schames Facebook page reads, "Established in 1927, M. Schames & Son is a fourth generation family operated commercial and residential paint store and hardware destination. Among the City's largest Benjamin Moore distributors for over 80 years, M. Schames & Son offers expert color matching and advice, exceptional on-site delivery service, witty repartee and competitive discount pricing."